Artisan tagliatelle made with high quality durum wheat, pure mountain water from the Maiella natural park in Italy and Italian black truffles. 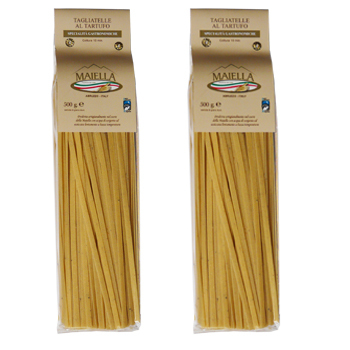 Truffle pasta pairs well with any truffle sauce, truffle oil or butter and with fresh truffles. Pastificio Maiella is an artisanal producer from Abruzzo, a region of Central Italy with a long tradition for pasta making. 100% fine quality Italian artisanal pasta. Nothing artificial. Durum wheat semolina, water, truffle.